Nach dem enormen Erfolg seiner „Ghostlights World Tour 2016/2017", die nach ausverkauften Konzerten in Asien, Amerika und Europa mit der live im TV ausgestrahlten Headlinershow auf dem letztjährigen Wacken Open Air in seiner deutschen Heimat abgeschlossen wurde, geht Tobias Sammets Avantasia im nächsten Jahr wieder auf Welttournee, um sein im Januar 2019 erscheinendes Album „Moonglow“ zu präsentieren. Das einzigartige Konzerterlebnis zwischen Bombast, Rock und Oper konnte in den letzten Jahren über 1,2 Millionen Menschen rund um den Globus begeistern und wird nun in einer noch opulenteren Show, bei der sich Tobias Sammet die Bühne mit den weltbesten Rocksängern teilt, eine einmalige Atmosphäre bieten. Mit über 3,5 Millionen verkauften Tonträgern zählt der aus Fulda stammende Tobias Sammet, der das Rockevent Avantasia 1999 erschaffen und 2008 erstmals live präsentierte, zu den international erfolgreichsten Musikern Deutschlands und arbeitete bereits mit Alice Cooper, Klaus Meine und Rudolf Schenker (The Scorpions), Bruce Kulick und Eric Singer (KISS), Eric Martin (Mr. Big) sowie vielen weiteren Größen aus dem internationalen Musikbusiness zusammen. Lange galt Tobias Sammet’s Avantasia als Geheimtipp. Doch nach unzähligen Auftritten als Headliner auf den weltgrößten Rockfestivals (Sweden Rock Festival, Quebec Music Festival, Barcelona Rock u.a. ), Goldauszeichnungen und mehreren Top-10-Platzierungen in den weltweiten Charts, ist die bevorstehende AVANTASIA - MOONGLOW WORLD TOUR 2019: DAS ROCKEVENT DES JAHRES! Exklusiv bei uns bekommt ihr gegen einen kleinen Aufpreis die schicken Metaltix Collectors Tickets - bestens geeignet als Geschenk und täglichen Anlass zur Vorfreude auf die Moonglow Tour 2019! 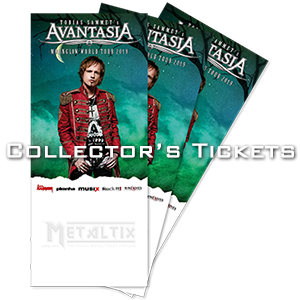 Register now your email address and never miss events, dates and news for AVANTASIA. Germanys most successful symphonic rock event will be touring the world in 2019 with its new album MOONGLOW. After sold-out shows in Asia, America and Europe, the tremendous success of their "Ghostlights World Tour 2016/2017" culminated in a headline show broadcasted on TV at Wacken:Open:Air, and next year, TOBIAS SAMMET’ S AVANTASIA is getting back on the road, to present its album "MOONGLOW", due to be released in January 2019. The unique concert experience mixing epicness, rock and opera has attracted over 1.2 million people around the globe within the last few years and is now returning with an even more opulent show in which Tobias Sammet will share the stage with the worlds best rock singers. Tobias Sammet, hailing from Fulda, created the rock event AVANTASIA in 1999 and celebrated its live premiere in 2008. With over 3.5 million records sold, he is one of the most successful musicians of Germany and has worked with Alice Cooper, Klaus Meine and Rudolf Schenker (The Scorpions), Bruce Kulick and Eric Singer (KISS), Eric Martin (Mr. Big) as well as many other stars from the international music business. For a long time Tobias Sammets AVANTASIA has been considered an insider tip. But after countless headline performances at some of the worlds largest rock festivals (Sweden Rock Festival, Quebec Music Festival, Barcelona Rock, etc. 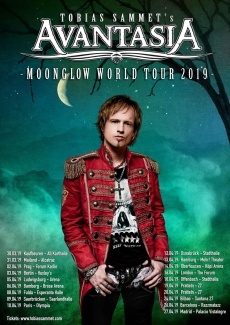 ), gold awards and several top 10 positions in the world charts, the upcoming AVANTASIA - MOONGLOW WORLD TOUR 2019 can only be considered the biggest Rock event of the year! Tobias Sammet states: "Ive been trying to calm things down for the last 18 months, but apparently my best way of relaxing is to be creative! During this phase, tons of ideas have been coming to my mind, that literally demanded to be realized in AVANTASIA’s epic style. I was so convinced of the songs that I realized very quickly: if ever there is to be a new chapter of AVANTASIA, then it has to happen with this material - past all the trends and rules of the music industry, hand-made and personal, with epic 10-minute pieces alongside catchy rock songs! Everything was created for only one reason: to write great music without any business men shaping it into bite-sized pieces for the modern entertainment landscape. MOONGLOW will be the most lavish album of my career, the biggest, most colorful thing and the best and most unreasonable luxury, I have ever created in my life. I can’t wait to release the album in January and then take the MOONGLOW WORLD TOUR on a journey around the globe, where you will witness the biggest show AVANTASIA has ever put on stage!"